My current VMware vSphere white-box will be 5 years old in August. It has an AMD Athlon X2 BE-2400 Brisbane @2.3GHz and 8Gb of RAM – and these days 8Gb of RAM is just not enough. The hardware for my NAS is more recent – a HP Microsever N40L with 6Gb of RAM, running FreeNAS 8.x. The cpubenchmark score for my vSphere box is 1333 – the score for the N40L is 979. While I still need to look at the performance of ZFS on the N40L (it is OK but not exactly where I would like it to be) I know that a lot more CPU is not desperately needed for new vSphere hardware (but it would be nice). I have been considering the Intel NUC (Next Unit of Computing) as an alternative to having a tower PC to run vSphere for a while now. It maxes out at 16Gb of RAM and it really shines in terms of its power efficiency (13-27 watts) and diminutive size (4″ x 4″). The i3 -3217U DC3217IYE NUC (Ivy Bridge architecture) is the current NUC that I have my eye on. 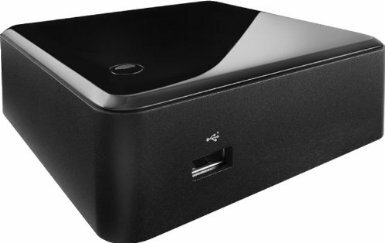 The issue with the NUC though is storage – I can either install an msata SSD in the NUC or use shared storage on my NAS (or both). I would like to use local storage on the NUC for speed and back up VMs to my NAS – the cost of SSDs will limit my local storage capacity though. The next generation of NUCs are based on the Haswell architecture and include Core i5 (Horse Canyon) and i7 (Skull Canyon) CPUs. The i5-3427U offering (cpu benchmark: 3580) is of interest to me here as it includes Intel vPro remote management capabilities. 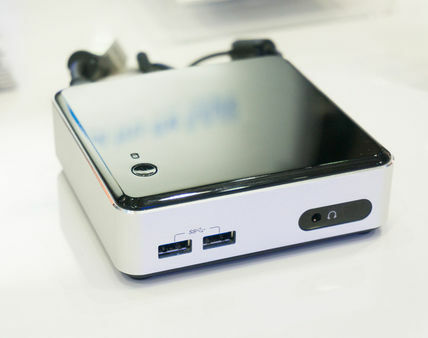 This still leaves us with the 3rd generation of NUCs (also Haswell) which have an on-board sata and sata power connector – these are slated to arrive in Q3 2013. The other option for a diminutive vSphere box is the Gigabtye take on the NUC called Brix. It looks like Gigabyte plans to offer Intel (i3 – i7) CPUs and AMD Kabini (E1-2100, E1-2500 & E2-3000 dual core, and A4-5000 quad core) CPUs. I think it will be worth keeping an eye on the Brix offerings to see where they differ from the NUC. The key areas for me will be efficiency, pricing and storage – what if Brix offers a 2.5 or 3.5″ internal drive bay, for example? I imagine that the AMD offerings will be cheaper than the Intel NUC – but we will have to wait and see. This does potentially make the Microserver a better vSphere candidate too, especially as the supported RAM has been upped to 16Gb. So I’ll be keeping an eye on the new generation of Microserver too. The additional CPU and RAM are quite welcome (especially for ZFS). I am also keen to know the power consumption for these machines as a whole. Either way with both the NUC and the Microserver I can build a power efficient and much smaller lab. If I can score a couple of NUCs and another Microserver by the end of the year, I will be a happy man! Might want to consider the Mint Box 2 for the Vsphere server – Fanless, 2 GBe Ports, space for msata and 2.5″ drive.